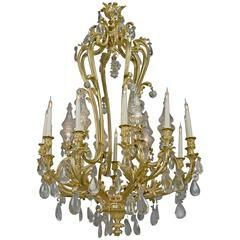 A large and important Louis XV style gilt bronze and cut-crystal thirty-light cage chandelier. French, circa 1870. This fine chandelier is of a grand scale at 223 cm high (88 inches). The chandelier has a central cut-crystal baluster stem surrounded by an open gilt bronze cage frame issuing scrolling S and C-scrolled branches. The branches support baluster form nozzles with moulded circular glass drip-pans. The chandelier is adorned all over with large facet-cut and moulded flat pendalogue drop prisms, and terminates in a faceted hexagonal terminal. This chandelier was previously hung at Rudding Park, Harrogate, Yorkshire, England. Rudding Park is a Grade I listed Regency country house in Harrogate, North Yorkshire, England. A postcard, illustrating the Yellow Drawing Room at Rudding Park, dating from the early 1950's survives showing this impressive chandelier in situ as the focal point of a sumptuous Louis XV style interior scheme. In the early 18th century Rudding was owned in turn by a succession of owners before the estate was acquired in 1788 by Alexander Wedderburn, Lord Loughborough, the future Lord Chancellor. Loughborough employed the garden designer Humphry Repton to remodel the landscape. In 1805 the estate was purchased by the Hon. William Gordon, who demolished the original house and commissioned the building of the present house in a new location. In 1824 the estate was sold to Sir Joseph Radcliffe, Bt. and the architect Robert Chantrell was commissioned to oversee the completion of the new house. The Radcliffe family continued to reside at Rudding until 1972 when the house and contents were sold. Rudding Park survives today as a world famous luxury hotel. Louis XV style crystal bird cage chandelier. Twelve-light chandelier with pear, grape and apple prisms.